If you’re like us, you’ve already set your sights on Dallas, Tex. for the three-day EDM festival Lights All Night on Dec. 29, 30 & 31 at Fair Park. The lineup is almost a “who’s who” in electronic dance music today with names like Avicii, Bassnectar, Calvin Harris, Flux Pavilion, Tiesto, Zedd, Markus Schulz, Bingo Players, Axwell, Alesso, A-Trak and so many more. Get more information about the event and the full lineup on the LAN event page. Okay, so you’re ready to go but don’t have tickets yet? 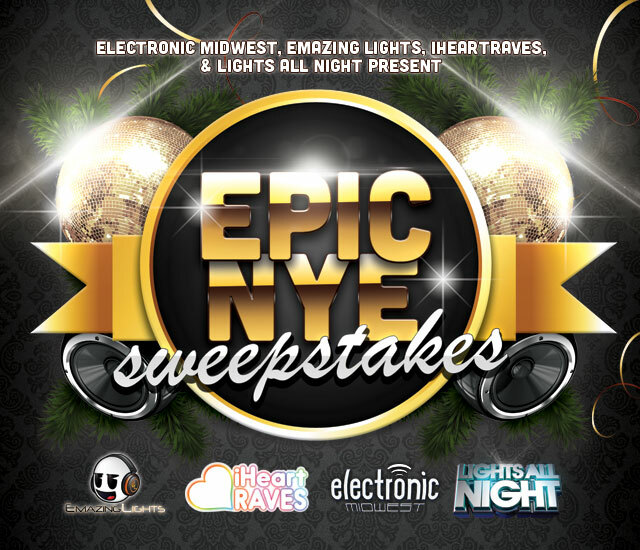 Electronic Midwest, together with Emazing Lights, iHeartRaves, Highland Entertainment, and MCP Presents, is giving you the chance to win tickets to Lights All Night along with clothing and merchandise to help you ring in the new year in style. TWO lucky winners will each receive a swag bag from Emazing Lights/iHeart Raves containing festival-ready gear like t-shirts, crop tops, leggings, gloves, LED glowsticks, lanyards and more. Deadline to enter is Wed., Nov. 28 at 11:59 p.m. CST. We’ll notify the winners via email shortly after. One submission accepted per person. Good luck! By entering the Epic NYE Sweepstakes, you agree to our Contest Rules and to receive occasional emails from contest sponsors. Giveaway: Tickets to Porter Robinson in Pharr, Tex.